« 24.10.13 "Dodging blame is the only concern of UK military leaders"
Following the relief of two generals held responsible in the 2012 attack on Camp Bastion, the Marine Corps has declassified and released the findings of the 19th August 2013 investigation. 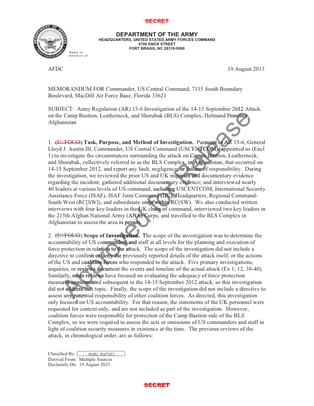 The documents lay out the preparation for the attack and what happened on the night of Sep. 14-15, 2012, and for the two generals held responsible, it's damning. Mentioned in the documents are an incoherent command structure, poor external security, and a number of warning signs.